Check Out Yellowbelly Crafts for Unique, Hand-Crafted Gnomish Masterpieces! We gnomes have been super crafty over here lately. Supposedly, it’s springtime, but neither our tiny toes nor our gardens have yet to thaw out. Believe it or not, I actually started taking a sewing class. These chunky fingers have more than their fair share of challenges, but it’s been therapeutic and I’m hoping to have a gnomemade skirt finished soon! I wanted to share with you another artist who is near and dear to my heart. Her name is Alison and she runs Yellowbelly Crafts. Alison makes really awesome gnomes in Lincolnshire in the UK! Perhaps you came across Ron the Gnome’s shout-out about her business in the most recent edition of International Gnome Club newsletter. Alison started making ceramics in 2004 after attending local classes. She uses kilns and molds in her production area to create gnomes, mushrooms, and garden areas. Take a look at these little guys…they’re pretty rad if you as me. And you didn’t, but I told you anyway. Prices range from about £30 to £55. All the posted craft fair dates are from 2012, but I hope you’re planning on making some public appearances this year, Alison! Awesome work! 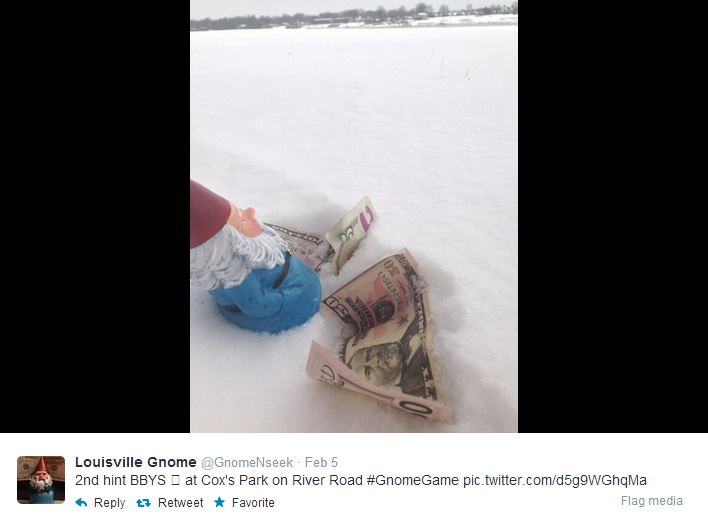 The Louisville, Kentucky Gnome Giving Away CASH! Stop whatever it is you’re doing and follow The Louisville Gnome on Twitter. Ugh another dumb gnome site?! I hear what you’re thinking. I’m telepathic like that. 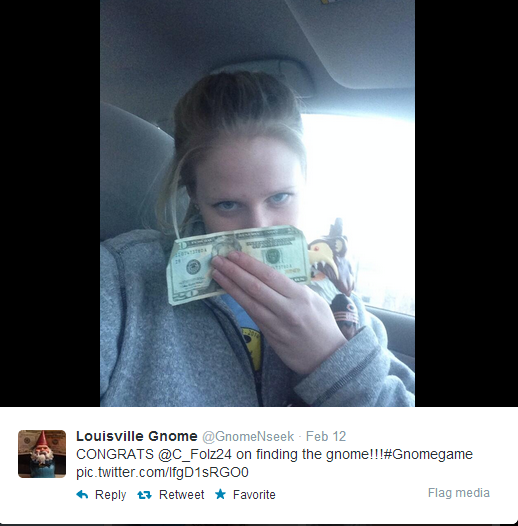 “Everyday, accompanied by a friendly gnome, money will be posted around Louisville. Followed by a Picture and a Hint. Please spend the money wisely,” so says this mysterious gnome who has emerged on the scene. The gnome game began in early February. And it is shrouded in mystery. SHROUDED, I TELL YOU! The gnome hider’s true identity remains a well-guarded secret. All we know right now is that the mysterious gnome hider is young and that he works for a charity called Free the Children. Not even joking…I was traveling through Louisville just yesterday and frantically checking my Twitter feed for location updates. Sadly, there were none and I returned home gnomeless. But maybe you’ll be the lucky one! I’ve seen pictures of people posing with 20s and 50s…but who knows how big the gnome bills can go! Help Name this Brooklyn Gnome! There’s a gnome in a Brooklyn pub in urgent need of a name. We learned about this little bugga through the Brooklyn Heights Blog. The Custom House in Brooklyn Heights (139 Montague Street) has a new gnome and sadly, he remains nameless. Custon House FB: Help us name our new friend !!! “________” The Gnome has arrived from Ireland and will be taking up residence at the Custom House and Joining us during Our St Patrick’s Day, Weekend Festivities. We need your help to name him. 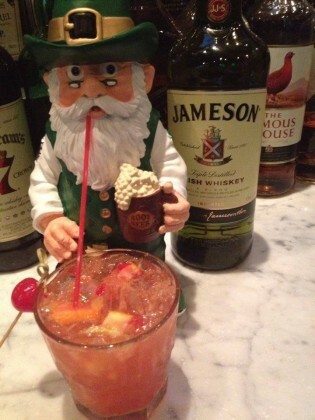 Enter our “Name the gnome competition” for a chance to win a $50 Gift Certificate for The Custom House. Entries must be received by St Patrick’s Day. 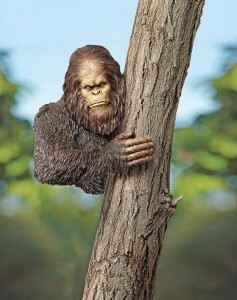 Like us on facebook to stay connected and see if your a winner. We voted for M’Goodness M’Guinness, but don’t let our expertise influence your vote too much. Get your vote on, gnomies…it’s your patriotic duty and such.